There is something magical about the moment the Light Rail comes around the corner onto 5th Avenue. Faces that were buried in papers and glued to screens simultaneously detach from their objects of attention and drift upward like flowers to the light as the large train windows are suddenly filled with color. While the murals slip past, the sleep-tinged eyes of the commuters catch on a leaping fox, a yellow tent, the fluorescent pink of a quirky painted cat. “I think that’s one of the cool things about Seattle – it’s a little weird, it’s a little fun,” reflected Courtney, who regularly takes the train to her job at the SODO Starbucks Corporate Building. “I think that having a little bit of art on your way to work or from work, it just seems like a little thing, but it makes such a difference to have a nice view.” As she stepped onto the train at the SODO Link station, she joined the ranks of the 50,000 who would ride the Light Rail past the murals that day. Because of its location and position on the train route, SODO is often called the “portal to downtown” or the “welcome mat of Seattle.” Although that is now a point of pride for the neighborhood, it used to be quite the shabby welcome mat. Two years ago, the walls that would later spark the morning ritual for commuters were instead two miles of bare building backs in various states of disrepair. What murals that existed were faded by time and marred by tags. The corridor is completely transformed now thanks to the SODO Track Project, spearheaded by 4Culture, the arts and culture development agency for King County, UrbanArtworks, an arts nonprofit, and the SODO Business Improvement Area (SODO BIA), which advocates for the collective interests of SODO property and business owners. Over the last two summers, local, national, and international artists have produced 29 distinctive murals lining the bus and train way from Stadium Station to Spokane Street, all based on the theme of movement. When Benzikry first moved back to Seattle after studying art history in the academic world of New York, she set herself on a mission to relearn the cultural landscape of the city. It soon became clear to her that public art was an integral part of that landscape. King County, and Seattle in particular, have a long history of public arts funding. Benzikry explained that in the early 1970’s, Seattle enacted legislation that required 1% of funds appropriated for construction projects to be allocated to works of art. The arts also have a special place in the SODO neighborhood in particular. Lauren Ross of the SODO BIA said that in fact, the only legal residence in SODO is an artists’ cooperative called Sunny Arms. “We don’t really have a lot of residents here, so that really transforms what kind of community this is,” she said. As artists who depend on industrial mediums are being pushed out of Belltown, many are moving into SODO looking for lower rents and a place for creative expression. This history of art, and public art in particular, has shaped the cultural landscape of the area. “It really opened my eyes to the possibilities of what art could be in everyday life…and the fact that people could just come upon it,” Benzikry said. “You didn’t have to be intentionally or financially paying to go and see it…it could reflect the stories of the people who live here and reflect where we’re going together.” For the people who have their livelihood here in SODO, the art truly has shaped the future of the area. “It really is to reclaim our neighborhood,” explained Erin Goodman, the executive director of the SODO BIA. “You look at some of our businesses and they look abandoned. So why not graffiti them, why not tag them? ‘Cause nobody cares! And we’re trying to say – people care.” Graffiti has been a constant problem in SODO, costing business owners hundreds of dollars to cover on a regular basis. According to the Graffiti Nuisance Ordinance, enacted in 1994, property owners must remove tagging within ten days of notice, under threat of fines of up to $100 per day. “A business that we met with earlier this week, he’s getting hit like two or three times per week, he’s paying 400 dollars a time to get it covered over,” Goodman said. In contrast, the BIA and 4Culture have not had to remove a single tag from any of the murals they have created with UrbanArtworks. Although the discouragement of vandalism has a positive effect on business owners, there were local graffiti artists who had some complaints about the SODO Track at the beginning of the project. However, instead of using the track art as a means to usurp graffiti art, 4Culture saw it as an opportunity. One of the reasons Benzikry said Seattle was especially suited for public artwork was “the opportunities for people to mash up, collaborate, and create things because of their different points of view.” Instead of trying to prevent the artwork of street artists like local SNEKE, 4Culture instead gave him a whole wall to paint in cooperation with Portland muralist Blaine Fontana. In their finished mural, “Equilateral Momentum,” koi fish drift across explosions of graffiti lettering and color-blocked triangles. What used to be a major financial burden and a public nuisance in the area has been transformed it into something new – something that is developing a very unique sense of identity for the neighborhood. Even the maintenance of the track is having an impact on the community. Much of the upkeep of the black border of the murals is done by the youth of local nonprofit UrbanArtworks, which also created several of the murals. UrbanArtworks works to connect young Seattle locals, especially those at risk, with contemporary artists who teach them art skills and get them involved in public art projects. The animals that bound and swim through a city landscape behind R&K foods were painted by these young people, who created “Stampede” from a design by Josh Keyes. 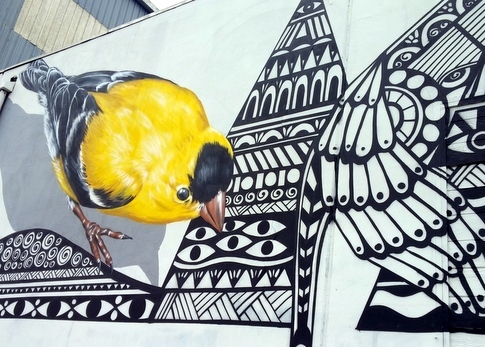 Several SODO track artists, like Addison Karl (creator of the “Chief Seattle’s Grandchildren” mural), have also done workshops with UrbanArtworks. behind-the-scenes creation of world-class art. In the meantime, the existing murals currently filling the windows of the Light Rail train will continue to snag the gazes of the riders. For just a few minutes, the busy Seattleites take the time to look, and think, and wonder.